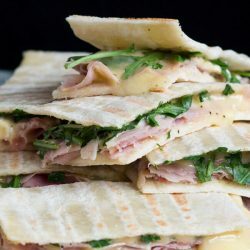 Rich and decadent, and ridiculously easy to prepare, these ham and brie flatbread sandwiches are ready in less than 10 minutes. Fantastic for a simple lunch, a quick snack or even a light supper. Keep the bread and cheese on hand in the freezer to whip up a flatbread sandwich at a moments notice. Turn on the sandwich press so it heats up whilst you are preparing the sandwiches. Cut the brie into rough slices, approximately 3mm thick. Layer the ham over the mustard. Arrange the brie evenly over the ham. Season the sandwich with black pepper. Arrange the rocket evenly over the cheese. Top the sandwich with the remaining flatbreads. Place the flatbreads in the sandwich press and cook for approximately 3 minutes, or until the cheese starts starts to melt out of the sides of the flatbreads. Carefully remove the cooked flatbreads to a cutting board, and slice into pieces with a sharp knife. Use the quantities in this recipe as a guide, and feel free to change it up according to your personal tastes. Add as much ham, cheese, mustard and rocket as you like. It's your lunch. This sandwich cooks best in a sandwich press. It can be cooked under an overhead grill or in a fry pan in a pinch. Use a sharp knife or pizza cutter to cut the flatbreads. This minimises the cheese and rocket spilling out on to your chopping board.